Amateur Traveler has done3 tours with Intrepid Travel taking our listeners and readers to interesting places (Morocco, Cambodia, India), with a 4th one planned to Africa. Here is the story of the first trip I took with them and why I like working with them. 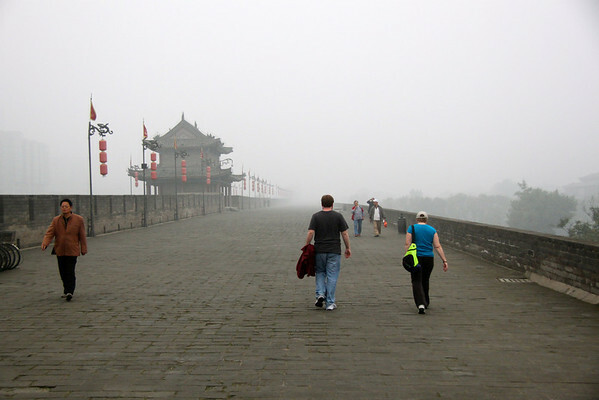 It started with an email advertising a guided tour of China from another company. It looked like traveling to China would be much cheaper than heading the other direction to Europe again, especially from out here near San Francisco, California. The one catch was that the trip in the email would be your typical 40 person bus tour. Our preferred way to travel is independently but we did not know if we were quite ready to visit China on our own. Even with having studied Chinese for a year in night school I never knew more than 200 Chinese characters and would be surprised if I remembered half of those today. They offered different levels of comfort. Personally I don’t need to stay in a luxury hotel every night. I sleep with my eyes closed. I need a quiet clean room. The China Highlights trip we ended up booking was their middle level of comfort. Their trips were not fully structured but offered a lot of free time which sounded like a better fit for people like us who are used to traveling on our own or for people not quite ready to travel on their own. 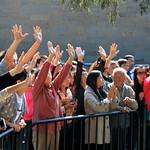 Their groups usually have a maximum number of 16 travelers. Because they have fewer people they can use more local transportation to get around. 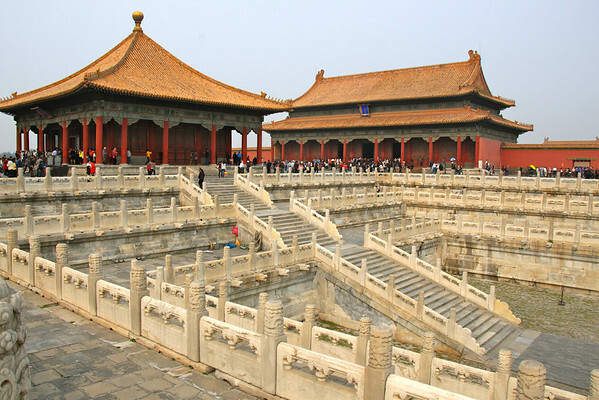 The China Highlights trip is a 9 day trip to Beijing, Xi’an, Suzhou and Shanghai. I had been to Shanghai but not the other 3 destinations. My wife and son had not been in mainland China. When we took the trip it was called China Express and ran in the opposite direction than it does now. We started in Beijing and ended in Shanghai. We opted not to get the airport connection in Beijing but made our way on our own to the hotel. We arrived the day before the tour started to recover somewhat from jet lag. We booked the extra night in the same hotel through Intrepid to make things simple. We explored Beijing on our own that first day and had a wonderful time. We visited the Temple of Heaven complex which was within walking distance from our centrally located hotel. We even met some very nice local art students from Xi’an who took us to a show they were having where we bought some of their “original” artwork. That night we met Robert who was our tour leader. Robert was easily the best thing about the Intrepid Tour. Not only was he knowledgeable and incredibly nice but throughout the tour he went out of his way to provide more than what was offered in the brochure. Within the first half hour Robert told us things like common scams in the area… like the one where people say they are local art students and sell knock-off artwork as “original” works. The highlights of Beijing were the Great Wall and the Forbidden City. We drove a little further out to see the area of the Great Wall at Mutianyu which was awe inspiring. I took the toboggan ride down from the wall with a few others from our group. Others like my wife and son hiked up and back down from the wall. Robert presented the different options and let people choose what worked for them. 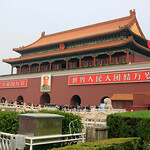 Our tour of the massive Tianamen Square and Forbidden City took half a day with Robert as our tour guide. The square was still decorated with Golden Week decorations. 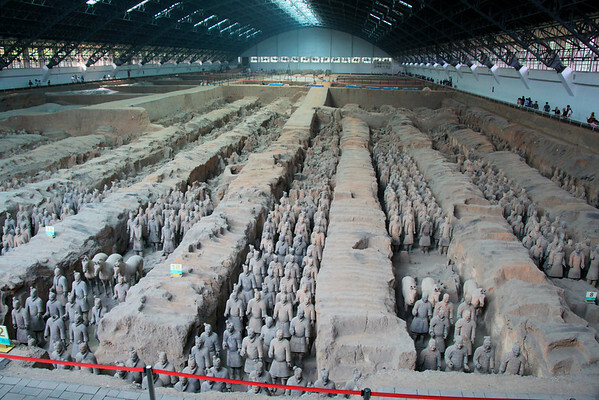 Although Robert was always our tour leader, Intrepid would sometimes provide a different tour guide for a different destination such as the terra cotta warriors at Xi’an. We took the night train from Beijing to Xi’an but because it was close to the huge Golden Week celebration we were only able to get accommodations in the 2nd class night train. Usually this tour takes the nicer train car. Because of this I would try and avoid traveling around Golden Week or Chinese New Year. We were picked up a local bus driver and tour guide before visiting the famous terra cotta warriors that date back to the 1st Dynasty in China. Surprisingly most of these warriors were broken into pieces by angry peasants just a few years after their construction as the First “Dynasty” ended a few years into the reign of its second king. The warriors are, in effect, the world’s largest jigsaw puzzle. Robert gave a quick tour of the muslim quarter of this ancient city at the eastern end of the silk road, then we had time on our own to explore and sample some of the local cuisine. We also had time for those of us who were interested to walk the ancient city walls. This kind of flexibility is an essential part of the Intrepid approach. The whole group would see the major sites and then there would be discretionary time where the more bold would explore on their own while Robert might guide the more timid to their desired destination. We were technically on our own for most meals but often ate as group since many restaurants could accommodate a group of 11. Before we left Xi’an we stopped at a center for people with developmental disabilities that is supported by the charitable arm of Intrepid. Score so far, charities one, mandatory gift shop stops zero. Suzhou is known for its numerous gardens which like the sites we saw in Beijing and Xi’an are UNESCO World Heritage Sites. We toured the Master of the Nets Garden. 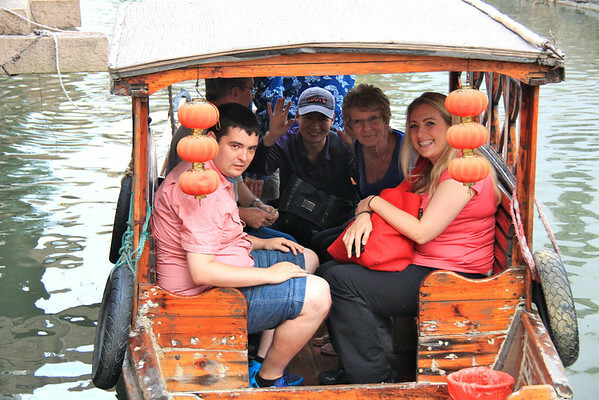 Another advantage of a group of only 10 people is that you can fit in 5-6 bicycle rickshaws or in 3 gondolas so we took a memorable ride through Suzhou’s traffic to the canals that cut through the old town. Like in Venice a canal ride may include a serenade as ours did. 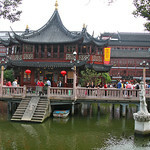 Shanghai has its gardens and teahouse from the Ming Dynasty, but is in so many ways a thoroughly modern city. We stayed just off its main shopping street a quick walk from the Bund area which was the center of Shanghai in its colonial era. The Bund is across the river from the new skyscrapers of Pudong. Robert polled the group as we arrived at the city and we rearranged our schedule to do a walking tour to orient us with the city the day of our arrival so that people could have more free time the second day. By this time we were comfortable finding restaurants on our own (which always seem to have a picture menu for people like us who don’t read Chinese), catch a cab or public transportation. My son had learned enough Mandarin to say “no thank you” to the many street vendors which proved much more effective than the same phrase in English. 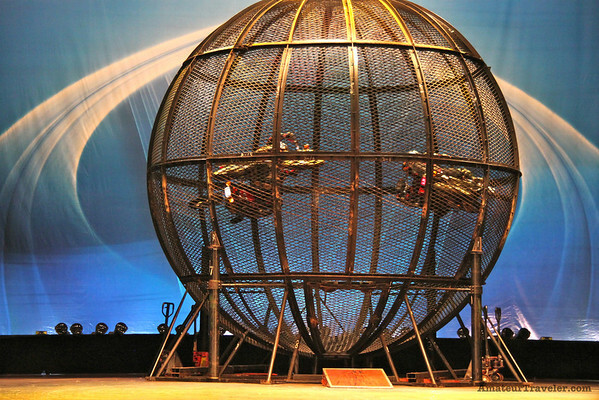 While in Shangahi we attended the Shanghai Acrobatics show. The confidence that it takes to ride a motorcycle in the sphere of death is probably more than it takes to explore a country like China, but a tour like the the China Highlights tour does not just show you the sites but also gives you more confidence as a traveler. I had two different impressions after our tour. The first is that I think I would now have the confidence to travel to China on my own. The second was that I would certainly look at an Intrepid tour again. Even for confident travelers, sometimes it is awfully nice to have an Intrepid and a Robert looking out for you. I traveled with Intrepid a couple years ago on their Backroads to Kunming tour that lasted two weeks. I had a blast. I went solo so Intrepid is great especially for the social aspect. We only had four people in our group along with our tour leader. I loved this tour because, again, we got away from the buses and “bulk travel” spots. We traveled by train instead and that was so much more fun and relaxing. We saw things usually tour wouldnt. 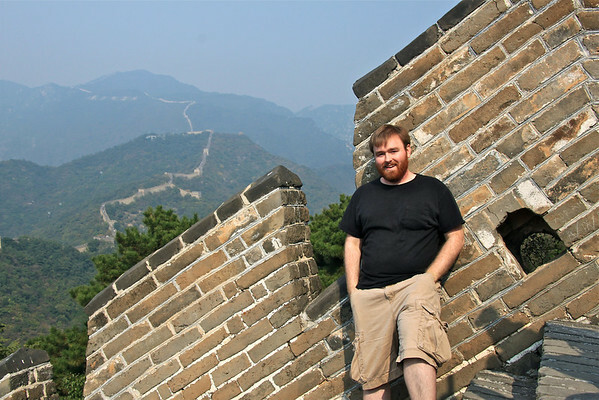 Our leader took us to a more remote spot of the Great Wall that we had entirely to ourselves the entire afternoon. Since our group was small, we got personalized service when we ate our and never had a bad meal. That’s such a tremendous positive considering we didn’t visit tourist restaurants and could never read the menus. 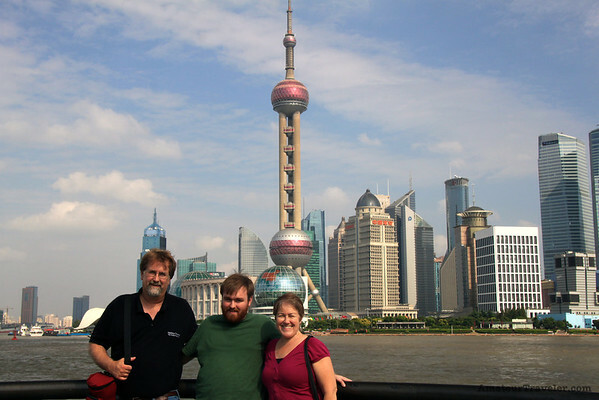 I could go on and on but traveling with Intrepid was the right way to see China for the first time. I too have used Intrepid when I travelled to Kenya and found the service of Intrepid and their tour leaders wonderful and would highly recommend them. Again it was a small group and all of us were solo travellerson and being a small group we did things that suited the group. We had a great adventure being stuck in mud not once, not twice but three times. None of us complained we loved it!! What a highlight. You got to do things that the other larger bus groups/companies etc may not offer. What I liked it the tour leaders are real locals and you get to see their country through their eyes. They have a true passion for their country and they tell you the good and the bad. So it was interesting to read your adventures in China as I can relate to your experiences but in a different country. I have used other tour companies and I still come back to Intrepid for value . We did the longer 21 day of China with Intrepid. 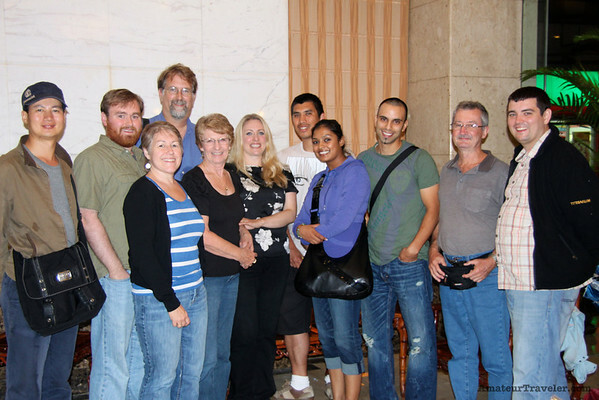 9 folks on our tour: American, British, Australian, South African, Swiss, Canadian. Definitely recommend this way of travel for a first time to China. Train travel was a great experience as was the local eating. Will definitely go back to China again, either on myown or with intrepid again.